During the past few decades, housing has been at the forefront of community-led initiatives to guarantee the right to an affordable city. As a consequence, housing, in many respects, has been leading the way for experiments with innovative financial and organisation models for community-led urban infrastructure and development projects. Solidarity funds, shared ownership models, organisational formats and decision-making mechanisms elaborated by housing activists and policy advocates however, are not applicable exclusively for residential developments. 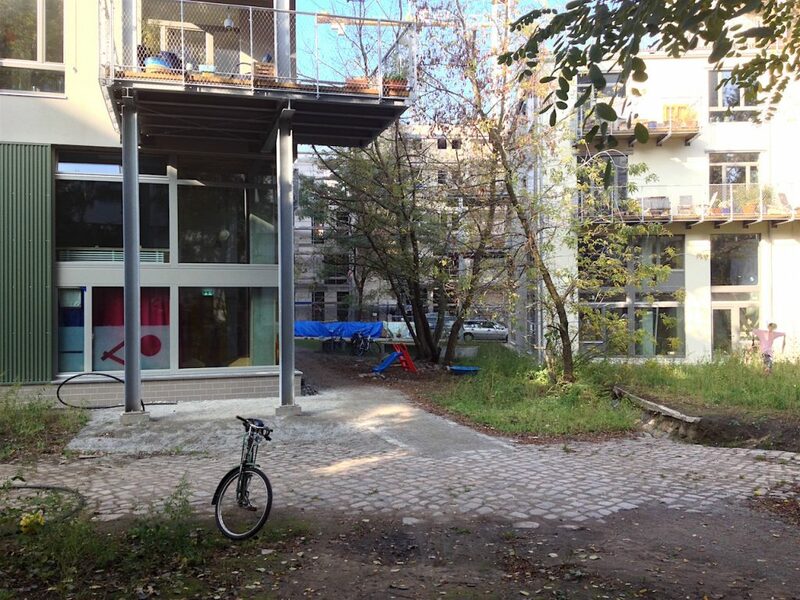 As Bea Varnai shows in this article, they have a lot to offer to civic spaces with limited or no housing component. Community-led housing (CLH) is increasingly being established as a viable and sustainable response to the challenges of providing affordable housing in the context of state withdrawal, spatial and social segregation and climate change. 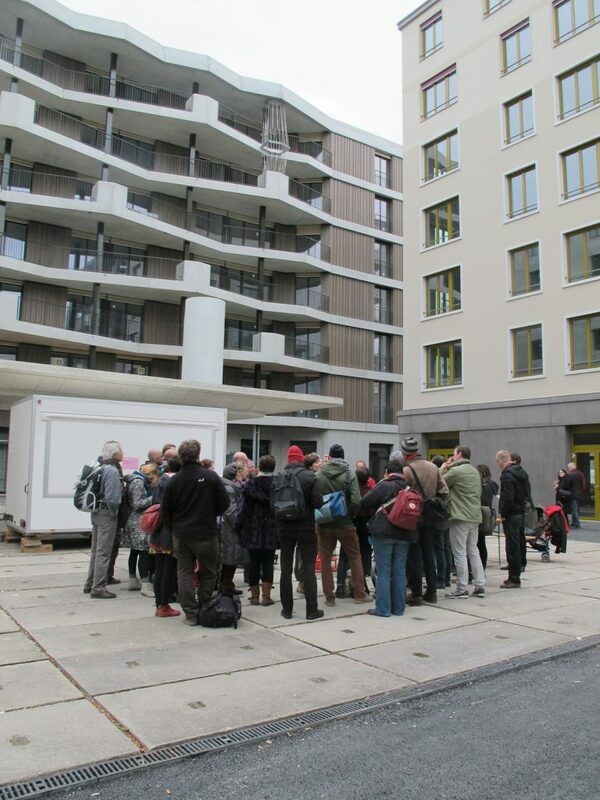 A diversity of CLH models have emerged across Europe: the Danish co-housing model focuses on shared spaces and environmental sustainability; the traditional cooperative housing model in Germany, Switzerland and France is undergoing a renewal with a focus on democratic governance and anti-speculation; the Anglophone Community Land Trust model, which aims to pull land out of the property market, is progressively gaining a foothold in continental Europe. In parallel, Southern European countries successfully experiment and adapt existing models, merging Northern European traditions with local experiences of self-organisation; while Eastern European initiatives seek to build new democratic alternatives for the provision of housing and social services. Whatever their model, CLH projects are costly and require investments exceeding the financial capacity of most inhabitants, and particularly low-income households. To be viable and to leverage sufficient economic resources, community-driven habitat initiatives need to organise a wide range of actors around their project and attract external funders. 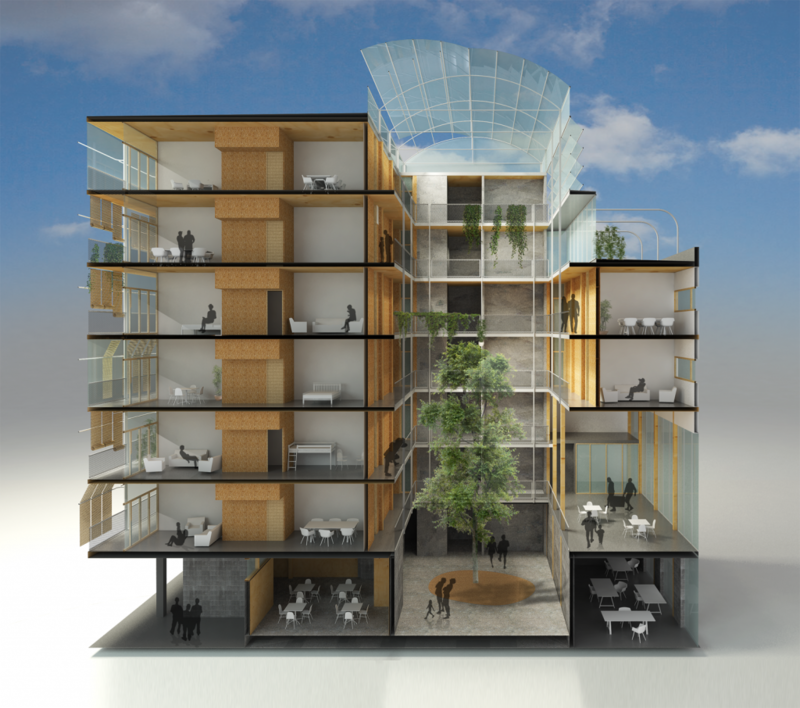 The challenge is to do so sustainably, while conserving ownership over the process. The strategies of CLH initiatives to provide adequate and affordable housing in a context of austerity, land speculation and increasing social disparities provide valuable lessons for other types of civic initiatives. In fact, some strategies and tools that have initially emerged in the housing sector are being adapted to a broad range of civic initiatives: cultural and public spaces, temporary use, and co-working spaces. This is the case, for instance, of the organisations trias Stiftung and Edith Maryon Stiftung. 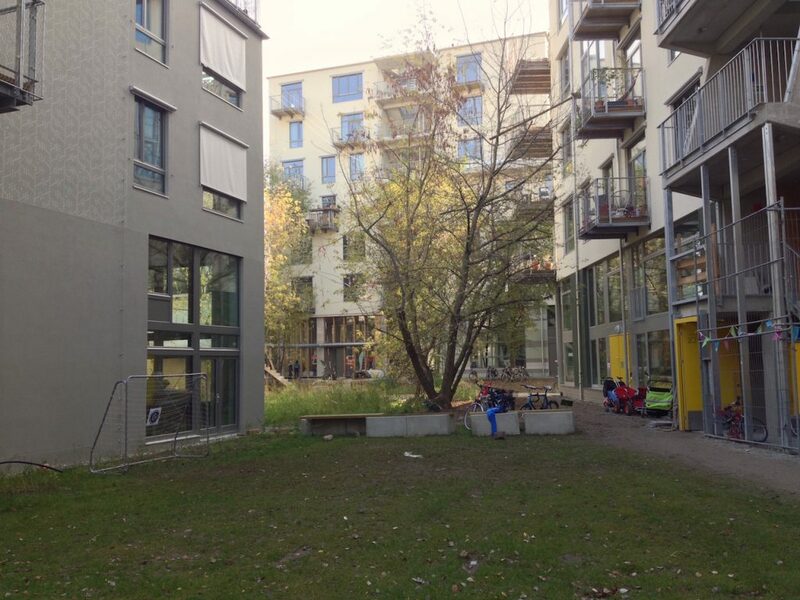 Both acquire land for non-profit purposes and provide long-term leaseholds to civic actors with the aim of enabling non-speculative housing developments (AlteSchuleKarlshorst), civic spaces (ExRotaPrint) or developments that combine both (Zentralwerk). CLH projects usually start by aggregating their economic capacities and financial means in the form of savings. Resources that were put in common are then used to leverage further public and private funding. In fact, the success and replicability of CLH models depend largely on the capacity of inhabitants to negotiate external funding at favourable conditions (at low interest rates, for instance) and to advocate for public support mechanisms, such as public guarantees or enabling public policies. Individual savings added up to community savings, whether it be partially or entirely, are the basic building block for any CLH project. The example of the Belgian social housing project L’Espoir shows that community savings provide not only the necessary seed capital to launch a project, but also constitute the fundaments for sustainable and strong communities. In 2004, at the initiative of a local NGO, the future inhabitants of the project established a collective savings group. In the following years, the 14 households contributed with a monthly rate of 50 euros to the scheme, building trust and solidarity by doing so, before acquiring and moving into their homes in 2010.Federations and umbrella organisations also contribute to the seed capital of CLH projects. 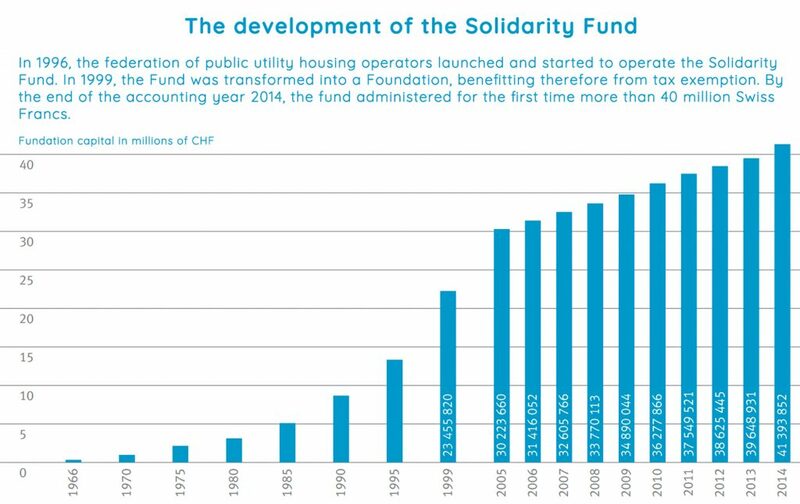 An example for this is the solidarity fund foundation, created by the Swiss Federation of Housing Cooperatives that administers 41.2 million CHF (2015). The fund was initially constituted in 1966 with the contributions of the Swiss Confederation, and is now sustained by the voluntary contributions of cooperative members (households), fiscal returns, returns on interest rates, and donations. The solidarity fund promotes housing development by public utility organisations, among which come housing cooperatives (although not exclusively). Concretely, it provides long-term loans (20-25 years) at low interest rate (currently 1%) to Swiss Housing Cooperatives and other types of non-profit housing developers (in 2015, a total of 112 loans were issued). The monetary and non-monetary support (technical assistance, advocacy, network building) of umbrella organisations is of crucial importance for kick-starting pilot initiatives and innovative projects. The Granby4Streets CLT in Liverpool for instance, benefited on several occasions from the support of Locality, the national network of community-led organisations in the UK. The process of putting resources in common creates solidarity and a sense of belonging to a group with similar goals and interests. It is a means rather than an end in itself; a basic building block for federating a group of individuals around a project, and for community building. Furthermore, community capital enhances the negotiation capacity of the inhabitants when dealing with public and private actors: by aggregating their capital, inhabitant groups increase their agency and are considered actors rather than clients or beneficiaries. Because of its long-term character, and the amounts required to launch a Habitat Project, no CLH initiative can be sustained with private equity (savings) only. The community will negotiate public or private loan schemes at affordable prices. Hence, the negotiating power of the community determines both the accessibility and affordability of external funding. Additionally, the existence of an enabling legal framework and the level of recognition of CLH models in a given context will considerably influence both factors. 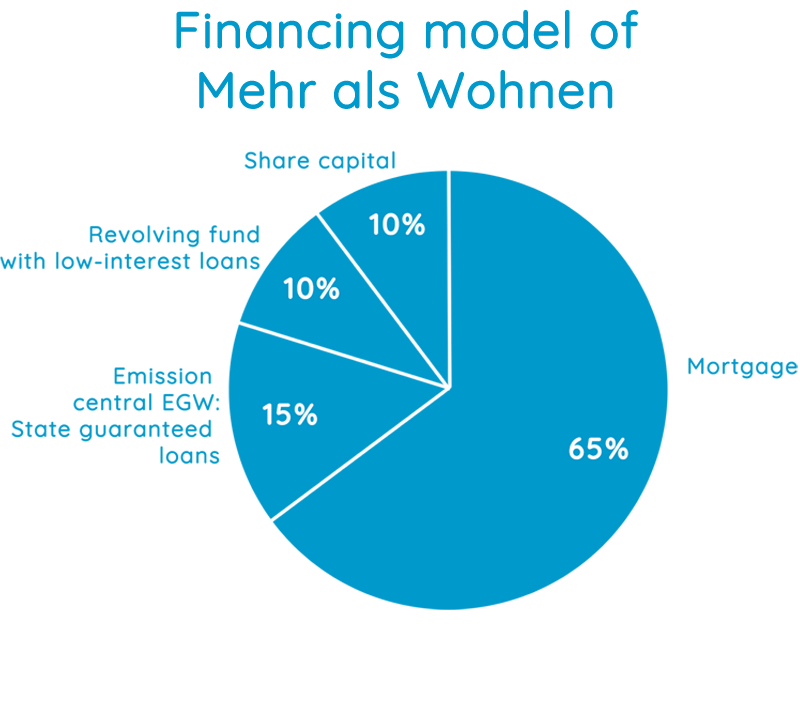 In the case of Mehr als Wohnen and Spreefeld, the institutional trust in the cooperative model drives down the risk, as perceived by the lenders, and therefore the cost of the loans: Spreefeld members had access to loans from the public bank for reconstruction (KfW) at preferential conditions (2.2% interest rate) to acquire the social shares of the cooperative. Additionally, the cooperative assets were recognised as a guarantee for individual loans, enabling the members of the cooperative to negotiate favourable conditions. In Switzerland, another mechanism helps decreasing financial barriers: the issuing of public guarantees. The loans levied by the ‘Emissionszentrale EGW’ (a cooperative itself) for non-profit housing developers are guaranteed by the Confederation, and therefore receive the highest rating on the financial market (AAA), representing technically no risk for lenders. This example shows that public support and trust in community-driven development can considerably enhance the affordability of external funding. On the other hand, some CLH projects reach out to public subsidies in order to complement loans and community capital. Subsidies decrease the financial barriers in favour of low-income groups and marginalised populations. This is the case for L’Espoir, where all of the 14 low-income households have received public subsidies for developing one of the first ‘passive houses’ in Belgium. Another approach consists of demonstrating the added social value of the project, for instance by integrating certain social services in order to access public subsidies, and establish partnerships with the private sector. An intergenerational approach, as practiced by the housing cooperative LaBorda in Barcelona, is an example for this. In fact, the care for the elderly constitutes a true opportunity for accessing public subsidies in ageing societies. 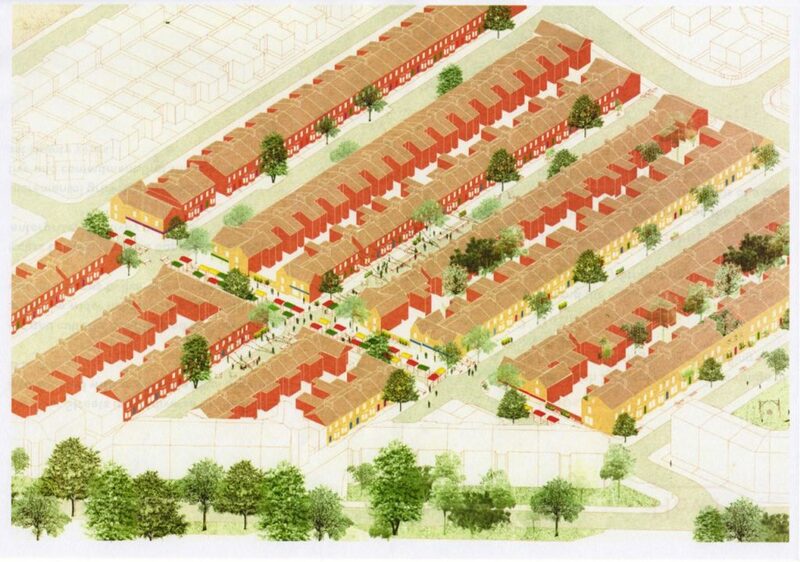 In the case of the Granby4Streets CLT, the social investor Steinbeck Studios put its faith in the community – driven revitalisation of the Toxteth area played a crucial role in the funding of community facilities and refurbishing homes, investing £500,000 in the project at a 0% interest rate over two years. Apart from social investors (impact investors), donors and philanthropic organisations – whether local or international – are also approached. While these may help kick-start CLH initiatives, and particularly pilot projects that receive little or no institutional support, CLH projects need to think of sustainable and organically-sourced funding solutions in order to develop models that are replicable and viable in the long-term. Particularly in the absence of an enabling institutional framework and public support, CLH initiatives build a broad network of alliances among the like-minded and synergies within the social and solidarity economy and social finance sector. 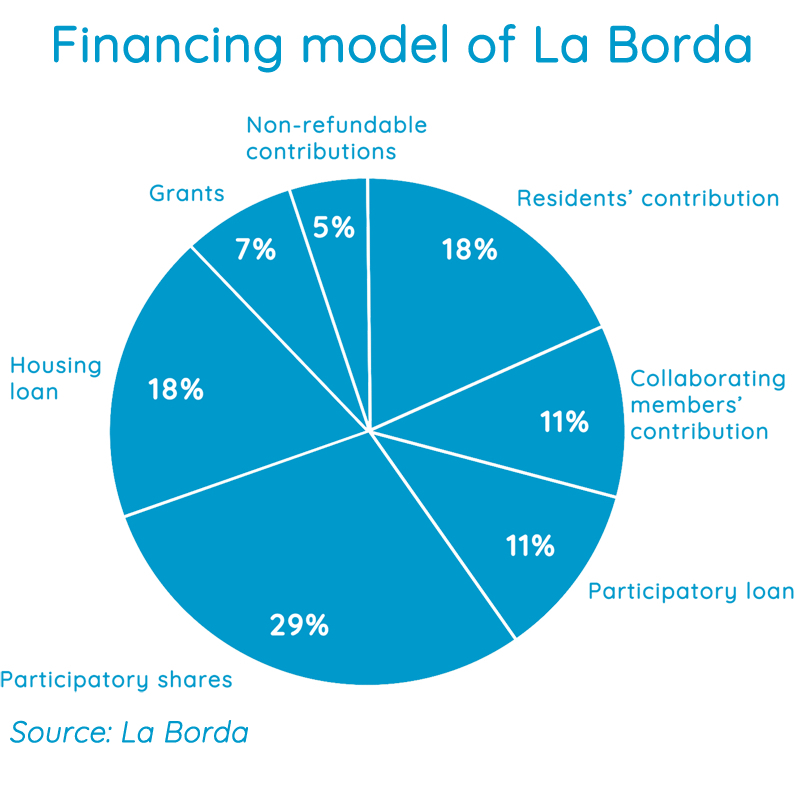 In the case of LaBorda, the share of the financial support provided by ethical and solidarity funding institutions amounts to 40% of the total costs (2.6 million euros) of the housing development. The financial services cooperative Coop57 issues 800 participatory titles of 1,000 euros each to the project. The titles have a time of span of 3 years, and an associated interest rate of 2.75%. LaBorda and Coop57 offer an example of a successful collaboration between a housing initiative and a cooperative financing institution, based on common values and a shared interest to reinforce the social and solidarity economy in Spain. Additionally, in order to lower the project costs, LaBorda issues capital participations (participatory loans), offering a small financial reward for subscribers. This is part of its strategy as a pilot project to create a critical mass around a cooperative, non-speculative, affordable and collective property housing project. Crowdfunding, another emerging example of community-based finance, has so far been less relevant for CLH projects, given the difficulty to gather a large interest group around a housing project. However, crowdfunding has proven successful in the case of other types of civic initiatives, such as projects for public spaces or cultural centres. Leverage funding for a habitat project is both a means for community-building and for establishing synergies with a wide range of actors. The table above illustrates that each project mobilises funding and support from a variety of sources according to the given local economic, institutional and cultural context and the scope of the project itself. Along their lifecycle, community-driven projects will constantly renew and forge new alliances with civic, public and private actors. The challenge for CLH initiatives and civic developments likewise lies in scale: today, the coproduction of our cities – beyond public consultations as a form of minimal participation in decision-making – is still limited, and financial, socio-economic and cultural barriers tend to exclude certain populations from adopting a proactive role in city-making.However, in an increasingly complex and decentralised urban world, and in a context of budget constraints, civil society is progressively being recognised as a partner in urban development and in the provision of housing, public spaces and social services. Rather than outsourcing state responsibilities to civic actors, the challenge is to establish sustainable civic-public partnerships for coproducing European cities. In other words, there is a need to collectively rethink how our cities are built in order to establish an enabling environment for community-driven development: involving the final users at all stages, establishing collaborations across sectors and perceiving city-making as a multi-actor and continuous process. The FundingTheCooperativeCity initiative is a valuable contribution to federating these efforts, sharing knowledge and disseminating successful experiences of inclusive and cooperative city-making across Europe in order to raise awareness on the value of community-led area development. Economy , article, commons, community, cooperative, crowdfunding, economy, ethical bank, finance, Funding the Cooperative City, housing, ownership.